In this stage you will model the display of a list of requisitions retrieved from the database. This stage’s modeling should be performed in the Tutorial 3-4 project, you imported at the end of the previous stage. In the previous stages we have learned how to display a form used for data entry and store the entered data in a database. Next we would like to be able to view the data previously entered, in a tabular manner – one row per record. The table will be part of the Open Requisitions view we have created previously. Resize the New Requisition button and position it near the top of the Open Requisitions view. We shall start of by adding a Table Display to Open Requisitions. Select the Display/Simple Table template ( ) from the palette, and insert it into Open Requisitions. The Simple Table template includes by default, a <Selected Row> element. We will ignore this element for the time being, but will make use of it in Stage 6 of the tutorial. Reusing previously defined models is an integral part of the modeling process, and significantly improves both development speed and model clarity. When you reuse a model, any change made to it affects all its occurrences. This ensures model consistency. You can reuse any type of model (data model, display model or process model). Locate the Requisition data structure in the Repository view. Or, in the Outline view. Zoom into the Requisition List table. Drag it into the model editor. And drop it inside the Requisition List element. Right-click on the Requisition element we have just created, and select repetitive from the menu. 1. Right-clicking on it again, and verifying that repetitive has a check mark next to it. 2. Checking the repetitive property in the Properties pane. 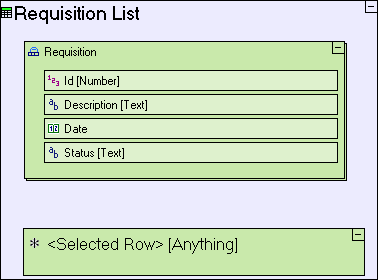 Notice that the Requisition List table is empty – the column titles appear, but there are no rows in the table. We still need to model the retrieval of data from the database to populate the rows of the Requisition List table. 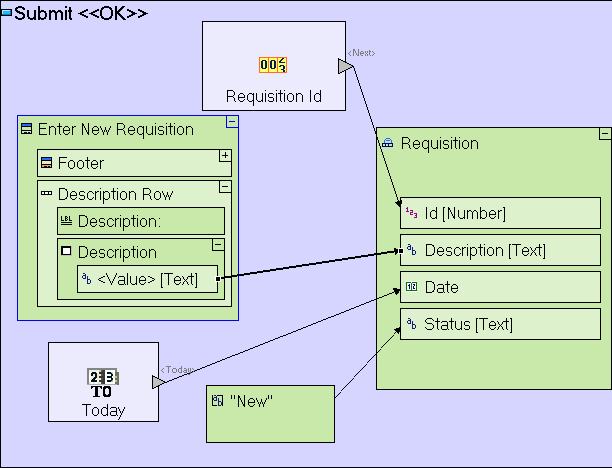 Select the Basic/Action template ( ), and drag it into the Open Requisitions model. Name it Populate Open Requisitions List. The Action template is a container for defining composite processes. Since the Populate Open Requisitions List has no trigger defined, it will be executed automatically when its parent (Open Requisitions) is executed. The name Populate Open Requisitions List was chosen because it is self explanatory. It has no effect at runtime, and you can decide on any other name with no change to application behavior. 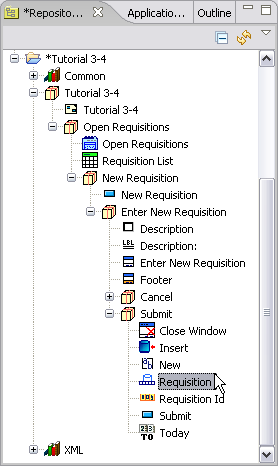 Notice that Populate Open Requisitions List is not a display model, but rather a process model. It is not part of the display of the table (as is the Requisition element of Requisition List), but rather some processing that takes place in order for the table to be properly displayed. As explained above, it has no triggers and hence it is executed automatically, so we call it an Initialization Process. Any display model may contain such Initialization Processes. The Populate Open Requisitions List process will generate a Requisition List data element (made up of Requisitions read from the database). The generated requisition list will then be sent to the display. 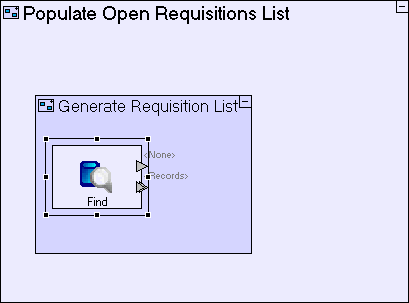 Zoom into Populate Open Requisitions List. 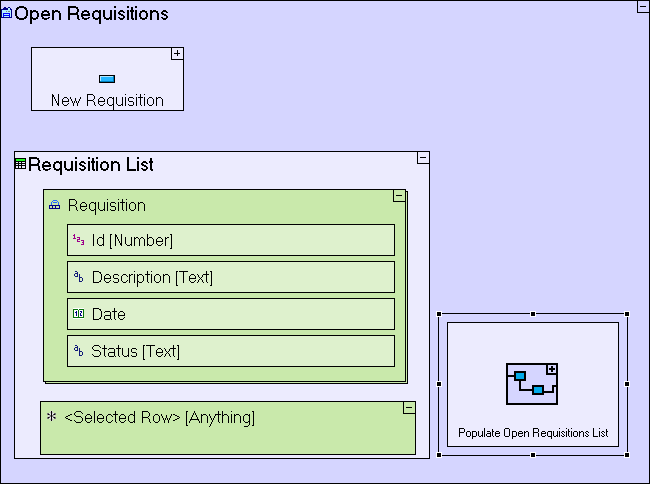 Select the Basic/Action template ( ), and drag it into the Populate Open Requisitions List model. Name it Generate Requisition List. 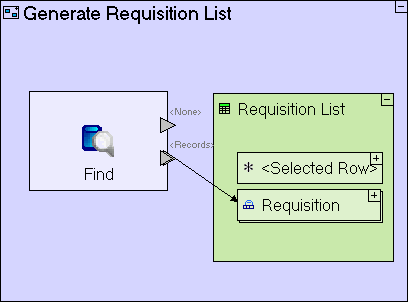 The Generate Requisition List starts by retrieving data from the database. This is performed by using the Find template. Select the Database/Find template ( ), and insert it into Generate Requisition List. The Find template includes two exits, <None> & <Records>, which are “activated” (and expose output) depending on whether Find finds any records or not. If no record is found, the <None> exit is activated. If at least one record is found, the records are exposed through the <Records> exit. If you look closely at the <Records> exit, you'll notice that it is marked as repetitive ( ), meaning that Find can output multiple records. We still need to define the database table from which Find Requisitions should retrieve records. This is defined through defining the Data Type of its <Records> exit - the data structure that the exit outputs. This is defined next. The records retrieved by Find should be stored in the correct data structure, which in our case should be a data structure representing the Requisition List display we have previously created. Drag the Requisition List model from the outline, and drop it next to the Find Requisitions element. 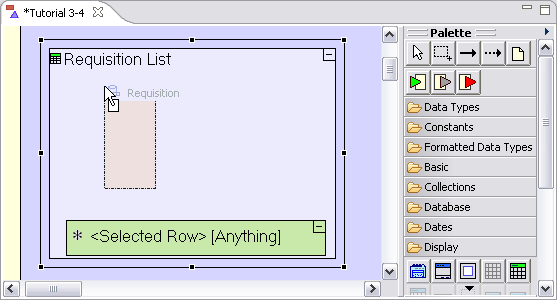 This creates a Requisition List Display Data Element, which represents the Requisition List model. Note that the Display Data Element we have just created is similar, but not identical to the Display Data Element we created through the Add Ancestor Reference function (in Stage 3). The similarity lies in that both are data representations of display models. The difference is that through Add Ancestor Reference, you create a reference to the actual runtime display (providing access to the displayed data), whereas in the current situation we are creating a new display data element in memory which has the same structure as the display, but is not the actual runtime display. Another way to put it is that we have created a logical (or in-memory) display data element. Expand the Requisition List element (by clicking the sign at its upper right corner) to display its content. Select the Flow tool to link the <Records> trigger of Find to the repetitive Requisition data element in Requisition List. 2. Implicitly defined the data type of the <Records> exit of Find, i.e. Requisition. 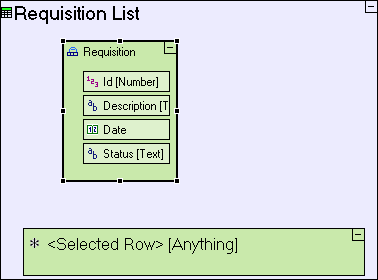 Since the Requisition data type is based on a Database Record template, Find knows which database table it should access (the Requisition table). The Generate Requisition List sub-process is meant to output data (the Requisition List display data element), so we need to define what data will be output, and where the output will be stored. Select the Exit slot ( ) from the palette and click on the frame of the Generate Requisition List element. Select the Flow tool to link the Requisition List display data element to the Exit slot we added. In the previous stage we showed how to use an Ancestor Reference display data element to retrieve user input from the display. We shall now use the same technique to perform the opposite, i.e. output data to the display. Zoom to the Populate Open Requisitions List element. Right-click on the Populate Open Requisitions List element, select Add Ancestor Reference from the menu, and select Open Requisitions. Now we can use the Open Requisitions ancestor reference we have created as the target to which Generate Requisition List will send its output table. Double-click on the Open Requisitions data element to zoom into it. 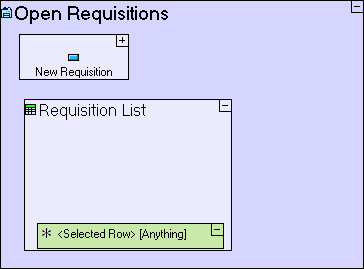 Use the Flow tool to link the Generate Requisition List exit to Open Requisitions/Requisition List. The data displayed in the table, is data you previously entered (or data bundled with the Tutorial 3-4 sample application). Click the New Requisition button. In the Enter New Requisition popup, enter a Description, and click Submit. Notice that the table is not updated, although the data is saved, as you may verify by refreshing your browser. Expecting the user to refresh the browser display manually is unacceptable; the table must be refreshed automatically when a new requisition is submitted. Refreshing the display means populating the Requisition List table with the most up-to-date data available, which is exactly what we have just finished modeling, so we can reuse the Populate Open Requisitions List process. Zoom to the Submit button we've created in a previous stage. 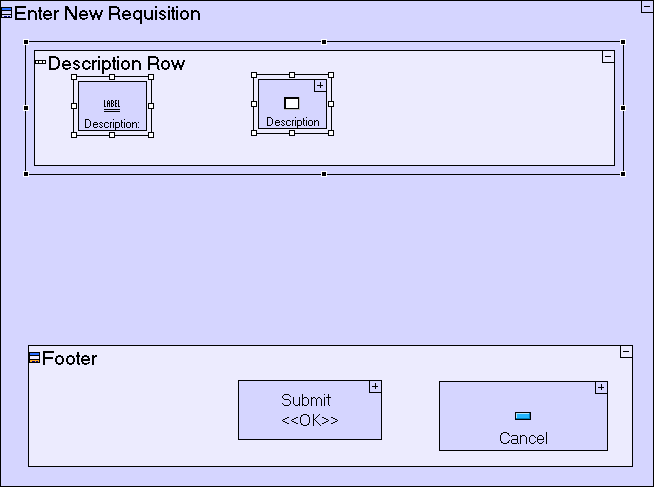 Select the Basic/Action template ( ), and drag it into Submit Requisition. Name it Refresh Requisition List. Select the Trigger slot ( ) from the palette and click on the frame of the Refresh Requisition List element. Select the Flow tool, and link the <Inserted> slot of Insert to the Trigger slot of Refresh Requisition List. Note that the trigger added to Refresh Requisition List demonstrates an alternative method for adding a trigger which controls the order in which processing occurs. The other method (using the Add Element context menu option) was demonstrated on the Close Window element we added (see Stage 3). This also demonstrates that the name Control itself has no effect on the way the trigger acts. It just makes the model more readable (exposing the trigger's purpose via its name). Notice that slots can serve as the source/target of multiple flow definitions. 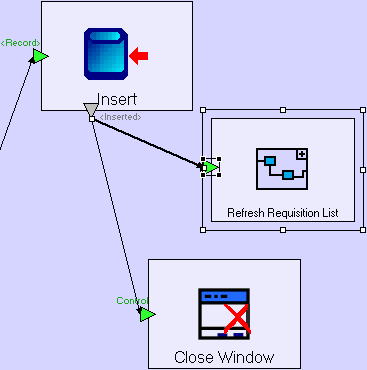 In our case, when the Insert model exits successfully, Close Window and Refresh Requisition List are both executed. 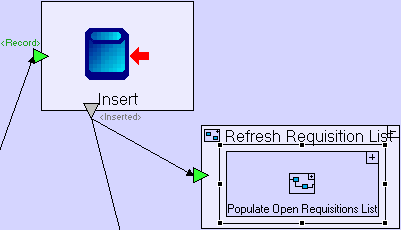 Drag the Populate Open Requisitions List process from the Repository (or Outline) and drop it into Refresh Requisition List. 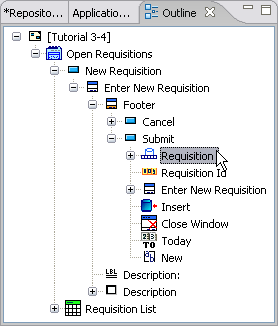 You may be wondering why we ‘wrapped’ Populate Open Requisitions List in another process (Refresh Requisition List), instead of placing it directly in the Submit button model, and creating the flow from Insert directly to it. The reason is that in that case we would need to add a trigger to the Populate… process, and since the process is reused in the Open Requisitions view, the trigger will also appear there, and will stop functioning, as the trigger receives no flow in that scenario. Save your work and view the application in the browser. Try entering new requisitions and verify that they appear in the list. Import the sample project Tutorial 4-5 and use it as the basis for the next stage of the tutorial. Add a Display/Row. Name it Description Row. Drag Description text area from repository/outline. Drag Description: label from repository/outline. You may now proceed to Stage 5, in which we shall add support for an Urgency field to the requisition.